This book features more than 150 authentic and delicious dishes, shown in over 750 photographs. 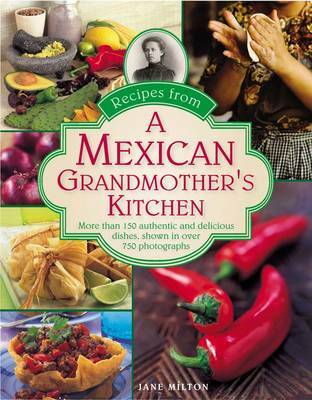 It offers a comprehensive introduction to Mexican food and cooking, including its history and cultural influences as well as its worldwide popularity. It is a visual guide to ingredients, preparation techniques and traditional recipes from across the country. From salsas and soups to complex main dishes, recipes include instantly recognizable Tacos and Enchiladas, together with exciting and less familiar dishes such as Pork in Green Sauce with Cactus, and Champurrada. The food of Mexico is a fusion of vibrant culinary traditions, with tastes and techniques that have been influenced by a variety of historical sources. The recipes in this book explore this diversity, from hot salty snacks, through main dishes of sizzling beef and fragrant fish, to exotic and delicious desserts. There are also drinks of all kinds, including intoxicating tequila cocktails and thick, foaming Mexican hot chocolate.Whether you are creating an authentic Mexican feast for the extended family, or a quick and easy supper for two, the tempting dishes in this book will bring an irresistible vibrancy and sense of drama into your kitchen.